Indie Rock Superstars Salute The Thin White Duke With All New Interpretations Of David Bowie’s Best! Features performances by Kittie, Dum Dum Girls, Electric Six, Rogue Wave, Heartless Bastards, The Muffs and more! Los Angeles, CA – David Bowie’s career has been defined by his unique ability to make artistically complex and challenging music sound like mainstream pop…ok, maybe pop music from an entirely different planet, but pop music all the same. As a result, the definition of rock music has expanded; Bowie never went mainstream, the mainstream always came to him. For these reasons and more, he is one of the most deeply revered and profoundly influential artists in modern rock. And nowhere can Bowie’s influence be felt more than in the world of indie rock, where bands and artists have taken Bowie’s fiercely independent streak, commitment to artistic integrity, and a diverse array of musical styles into the 21st century and beyond. 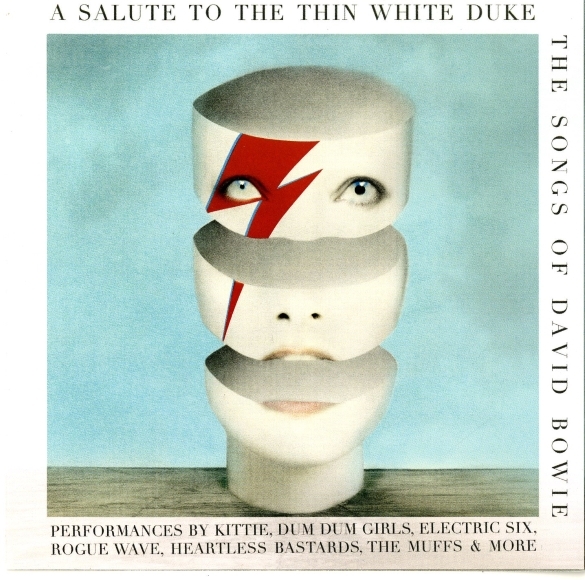 Now, a truly impressive gathering of indie and modern rockers have gathered to pay tribute to the man with A Salute To The Thin White Duke – The Songs Of David Bowie to be released on both CD & vinyl as well as mp3s on October 2 courtesy of Cleopatra Records. Jared Artaud from The Vacant Lots succinctly expressed the challenges of approaching Bowie’s music, “It’s hard to touch Bowie. He’s an architect. What he’s done, you can’t make it better, so we wanted to reconceptualize it & approach the song from another point of view.” And The Tulips offer this entirely accurate description, “Covering a Bowie tune was like jumping into a cab and realizing there’s a tiger sitting shotgun, and no one says a word.” A wild ride indeed! And fans of Bowie will find this collection of covers equally as thrilling! This entry was posted on Thursday, September 24th, 2015 at 19:04	and posted in David Bowie Tribute, Press Release. You can follow any responses to this entry through the RSS 2.0 feed. « Something Else! Exclusive Stream of “I See You Messenger” by the AndersonPonty Band!